The Yorkshire Terrier tail and the issue of docking is a very controversial subject. 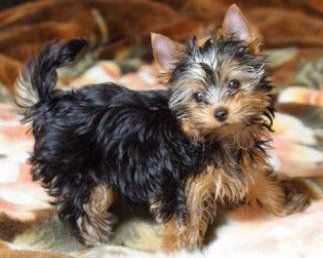 In the US, per AKC standard, the Yorkie should have its tail docked to a medium length. There are many other countries around the world that ban the procedure of docking a dog's tail. 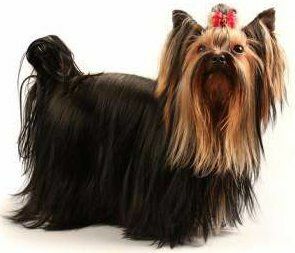 The Yorkshire Terrier has its tail docked, per AKC official breed standard conformation. While completely accepted in the US, there are many countries that have banned this practice. In America, the largest and most respected dog breed club, the AKC (American Kennel Club) lists the official conformation of the Yorkshire Terrier breed to have a docked tail, to a medium length. therefore, if you plan on showing your dog, you will need to have the docking done. The ANKC, CKC, NZKC and UKC also call for the Yorkie's tail to be docked. Most breeders will have this done, as it is in the best interest of the dog to have this procedure done when they are a very young puppy, at just a few days old. However, there are some breeders, who if selling a Yorkie as a pet ( and not as a show prospect) may not have its tail docked. Never-the-less, the majority of breeders in American will have the tail docked. The World Small Animal Veterinary Association and the European Convention for the Protection of Pet Animals oppose tail docking and have worked very hard to pass laws banning this. Since 2007, many countries have banned this practice. * Currently in the US, only two states have provisions regarding tail docking. In Pennsylvania, it cannot be done without anesthesia on a puppy over the age of 5 days old; however, if a dog is at least 12 weeks old, it may be done under anesthesia. Between the age of 5 days and 12 weeks, it can only be done if a licensed veterinarian deems it medically necessary. In Maryland, docking must be performed using anesthesia. There is not reason based on health or happiness to perform Yorkie tail docking. Having a docked tail does not improve any vital element of the dog including motor skills in regard to movement or health. Why are Yorkie tails docked? The only reason is so that the dog fits the breed standard of the AKC and the other dog clubs that call out for it. Therefore, this alteration in appearance only for aesthetic purposes. If the owner of a Yorkie is not planning on showing their dog in dog shows, there is no reason to dock the tail, other than a personal preference to have a dog that matches closest to breed standard conformation. If an owner is planning to show their Yorkie in an AKC, ANKC, CKC, NZKC or UKC Conformation Event, the tail must be docked in order for him or her to compete. If an owner is planning to not show their Yorkie in an AKC, ANKC, CKC, NZKC or UKC Conformation Event, there is no reason other than aesthetic reasons to have this done. However, many owners will not have a say, as most will obtain their Yorkie puppy well after the procedure has already been done. Potential owners are often surprised that when looking at puppies for sale, it is mentioned that this has already been done...Therefore, they do not have a chance to decide for themselves. 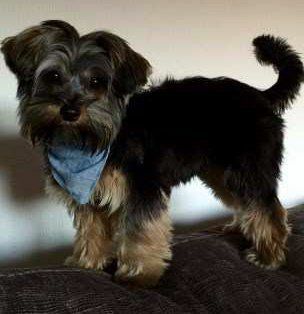 If one does not want their puppy to have a shorter, erect tail, one would normally put a deposit down on a pup of an expected litter, with explicit instructions to leave the Yorkie tail as it is. 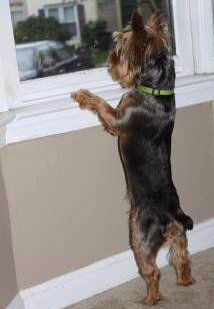 This is not uncommon and for this reason, there are lots of Yorkies with natural tails... Our own poll regarding this showed a 60/40 ratio....showing that almost 1/2 of all owners of purebreds, have a dog that is left natural. it has a slight wave to it. At this natural length, it will move around quite a bit... as opposed to the shorter, erect docked tail. If an owner is living in a country in which this is banned, certainly we suggest to not have the tail docked...As it would most likely need to be done in a less than sterile, ideal environment. Docking is the procedure that is done to Yorkie newborns, in some counties, in which their naturally long tail is made shorter via amputation. This is not to be taken lightly... any sort of procedure such as this does cause discomfort. This causes the dog's tail to stand straight and erect. With this breed, it is cut to 1/2 the normal length thus resulting in a medium sized tail, which then will stand up vertically. The 1st involves constricting the blood supply to the Yorkie tail with a rubber ligature for a few days . When done correctly, the top part of the tail will fall off. This is normally done when the puppy is 24 to 96 hours old. The puppy's tail falls off in about 3 days. The 2nd involves the cutting of the dog's tail with surgical scissors or a scalpel, performed by a veterinarian. When done this way, it is normally done at the young age of 2 to 5 days. Anesthesia is not used as it is considered a risk at this age. When carried out correctly, the procedure causes only a brief period of discomfort. Why? Because the puppy does not have a fully developed nervous system...This is why it is done so early in their life...If done later, it would be considered a major surgery and would be quite painful. If a puppy does not have this done at the above early age, it is then recommended to wait until the puppy is older than 10 weeks. Why? Because the older puppy or dog will feel quite a bit of pain. Therefore, this is done with the dog under anesthesia. It is dangerous for a very young puppy to be under anesthesia, so the procedure is put on hold until the Yorkie is older. In some cases, an un-docked adult dog many need to have this done due to severe trauma to the tail...while rare, this can happen due to injury (a door is accidentally closed on the tail, etc). . The most comprehensive, helpful Yorkshire Terrier book that exists. Now in both Print & eBook.